A new born baby was discovered at the Holy Child of Jesus Church in New York in the Nativity scene in the manger. The baby still had the umbilical cord attached and was thought to be only a few hours old. The child was rushed to Jamaica Hospital for treatment, but was said to be healthy and in stable condition. The unknown mother obviously did not follow New York’s “safe haven” law when she abandoned the baby in the manger, but on the bright side, she did not abort it and now one of God’s children has a chance to be adopted and live the rest of its life. New York has a so-called safe haven law that says a newborn can be dropped off anonymously at a church, hospital, police or fire station without fear of prosecution. But the law, known as the Abandoned Infant Protection Act, requires that the child be left with someone or for authorities to be called immediately. Police said that didn’t happen in this case, which led investigators to begin searching for the person who dropped the child at the church. The custodian on duty at the Holy Child of Jesus Church in New York this week beheld a scene straight out of Scripture. Hearing the sound of a baby’s cry, he found a newborn wrapped in towels lying inside, of all places, the wooden manger of the church’s nativity scene. The infant, who weighed about 5 pounds, still had his umbilical cord attached. As emergency crews arrived to take him to the Jamaica Hospital in Queens, his eyes remained closed, his slight arms outstretched towards the sky. The identity of the baby’s mother is still unknown, though police told the New York Times that a video shows a woman arriving with the baby and departing without him. She likely entered the church between 11:30 a.m. and 1 p.m. Monday, the period in which the custodian left the empty chapel for lunch. Doctors said the baby had been born just four to five hours before he was found, and police told the Associated Press that he is in good health. UPDATE I: Mother Who Left Baby in NYC Nativity Manger Won’t Be Charged. A mother who left her newborn baby in a Christmas manger inside a New York City church will not be prosecuted, authorities said Wednesday. “After a full review of all the facts and circumstances surrounding the discovery of a newborn infant this past Monday in a creche inside of Holy Child Jesus Church in the Richmond Hill section of Queens County – including locating and interviewing the mother – my office has determined that no criminal prosecution of the child’s mother is warranted,” Queens District Attorney Richard Brown said in a statement. 84 year old Bill Hogencamp of Phenix, Alabama was diagnosed with incurable cancer of the gall bladder, liver, colon and the lining of his abdomen last May. His doctors told him that he would never see Christmas, December 25, 2014. Mr. Hogencamp had accepted his fate as be believed he had led a full life. However, Bill Hogencamp and his wife, Kathy, made the decision to still try and fight the cancer as well. 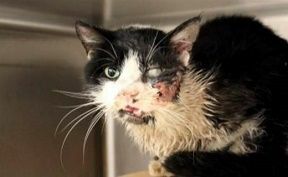 In October he had surgery to remove three large tumors. Following the surgery is when the miracle began. After the surgery, his wife went to pick up her husband from a rehabilitation center, she noticed a dog dangerously wandering down the road. the dog walked past several cars, before it came up to hers and put his paws up on her door. She opened up the door and took in the stray pup. Initially they were not going to keep the dog; however, after not being able to locate its owner, they became attached to the little Maltese. They named him Mahjong. The dog fell in love with Bill Hogencamp and rarely left his side. The two became inseparable. Hogencamp underwent chemotherapy. Just before the holiday he received some miraculous news, Tests showed that Hogencamp was now cancer free. Despite an extensive search and nearly a dozen false leads, the Hogencamp’s were never able to track down the dog’s owner. 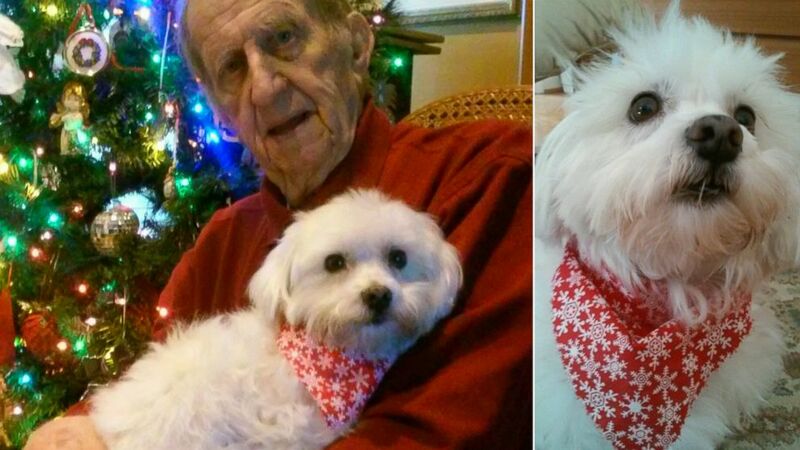 They learned from a vet they visited during their search that he was a Maltese, probably around 6 years old, fixed but not chipped. Whenever Hogencamp sat down, the dog — who they named Mahjong after Kathy’s favorite card game — would jump in his lap. Whenever Hogencamp napped, Mahjong would curl up next to him. When Hogencamp returned home after being out, Mahjong would hop onto his hind legs and dance with joy. MIRACLE OR HAPPENSTANCE, YOU MAKE THE CALL, BUT DON’T FORGET THAT DOG IS GOD SPELLED BACKWARDS. Hogencamp’s doctors were at a loss for words to explain his miraculous medical turn of events of now being cancer free. However, the Hogencamp’s believe that little Mahjong has played a huge part in Bill Hogencamp’s remarkable and miraculous recovery. “The dog seemed to know right away that Bill was sick and it was his job to take care of him — and Bill knew it was his job to take care of the dog,” she said. WOW … #4 Auburn Stuns #1 Alabama 34-28 on Last Play of Game as ‘Second’ Miracle at Jordan Hare Happens in Two Weeks (VIDEO) .. Twitter Erupts!!! It was an Iron Bowl for the ages, the #4 Auburn Tigers stunned #1 Alabama 34-28 on the final play of the game. The Crimson Tide tried a 56 yard field goal with 1 second left on the clock to win the game when another miracle happened on The Plains. 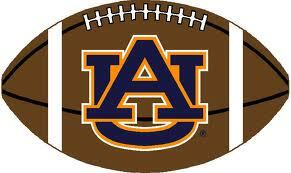 The FG was short and the Auburn Tigers’ Chris Davis ran the ball back 109 yards for a game winning touch down. The irony of it all was that Alabama coach Nick Saban lobbied for an extra second to be put on the clock to attempt the long FG. Then they set up for the game winning field goal and the rest is Iron Bowl lore. The Auburn Tigers will head to Atlanta, GA and play for the SEC Championship. 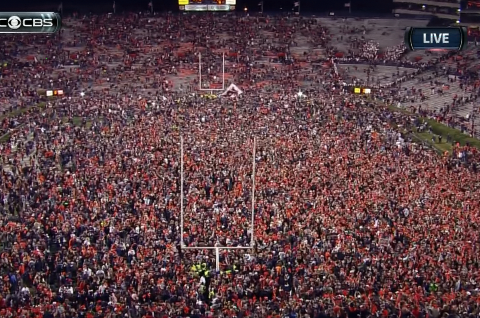 Auburn Tiger fans rush Jordan Hare Field after the stunning War Eagle victory!!! 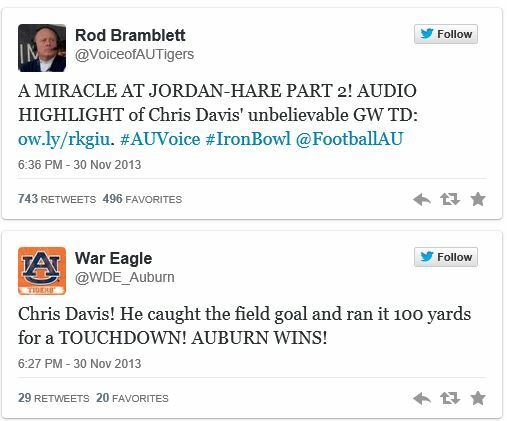 Last week it was the “Prayer at Jordan Hare” as the hail Mary pass was tipped by two Georgia defenders on a 4th and 18 play into the hands of Auburn WR Ricardo Louis for a game winning TD! This week it was even more improbable as the game seemed all bust lost after Bama scored on a 99 yard TD pass. 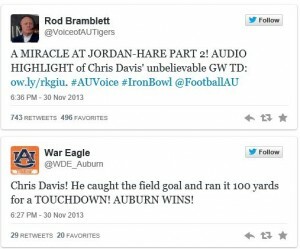 The play of the year in college football … Auburn’s Chris Davis runs back the missed Bama FG 100 yards for a game winning Iron Bowl TD!!! Check out the Bleacher Report for more from the game of the year. UPDATE I: I nesver thought it was possible, but Nick Saban got out-coached. On a personal note, I have never really questioned Nick Saban’s coaching as he is one of the best in the business, but today he seemed off his game. However, he went for it on 4th down when he was at about the Auburn 20 yard line in the center of the field and failed. Even though his kicker had already missed two FG’s, he really should have kicked it there and tried to go up by 10 points. Then on the last play of the game, no what in hell I would have attempted a 56 yard FG with a red-shirt freshman kicker who had only tried 2 all year. Sabin does realize that ‘Facing the Giants’ was a movie and the last second FG kick by David of 51 yards was a movie as well, right? I am not sure how Saban left his chances of winning a third consecutive BCS Championship to a freshman kicker, rather than his senior QB AJ McCarron in OT. 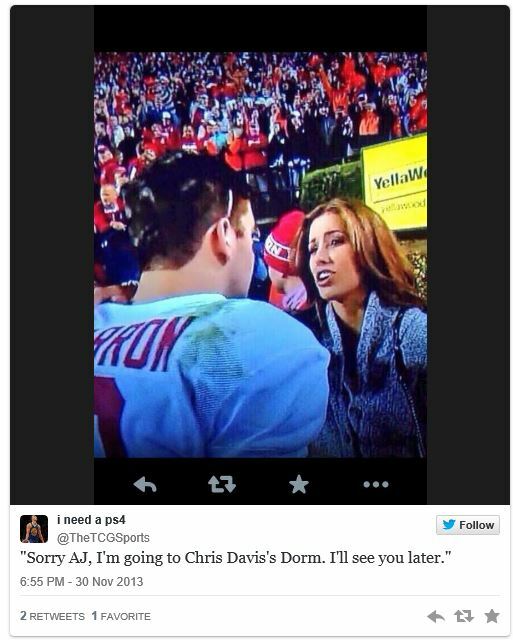 UPDATE II: Twitter erupts over Auburn’s stunning victory over Alabama. Some of the better tweets can be seen here, but check out the rest of them at FOX Sports, some are really good! Maybe the best Tweet of them all … OUCH, that’s going to leave a mark!